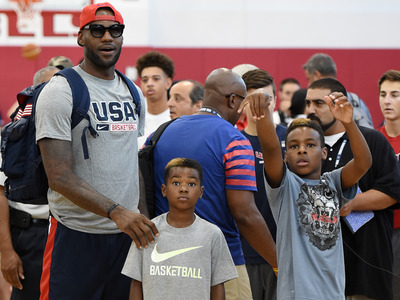 Getty ImagesLeBron James with his sons Bryce (left) and LeBron Jr. (right). LeBron James once again blew the basketball world out of the water when he helped the Cleveland Cavaliers take home the NBA title. But it looks like he has some competition from his own son. According to ESPN, 11-year-old James Jr. has already received standing scholarship offers to play for both Duke and Kentucky. James Jr. has been receiving offers for a while now. It looks like James Jr. has a bright future ahead of him.